(leading to ExpertRating Business Management Skills Certification). Are you interested in acquiring practical business experience in strategic planning, management, and finance without enrolling in an MBA program? This course is for you! You'll understand the significance of strategic planning and discover how external and internal environmental factors affect an organization. You'll learn about various organizational structures and determine how to use leadership, motivation, and control for maximum impact. You'll understand how successful organizations use performance measurements to stay on track. You'll also master the fundamentals of accounting and increase your knowledge about key financial terms, cash flow management, financial statements, and cost control. You'll learn the difference between financial and cost accounting. You'll discover various financial investment models and you'll learn the basics of financial planning and budgeting methods. You'll even gain an understanding of the basic principles of business law, contracts, and the principal-agency relationship. And you'll explore the forms of business organization and learn about ethics and organizational politics. This course includes a knowledgeable and caring instructor who will guide you through your online Business Management skills class assisting you with lessons, facilitating discussions, and answering your questions. About the ExpertRating Online Business Management Course instructor : Tony Swaim has helped many clients, colleagues, and students reach their professional and personal goals. He has been an online instructor since 1998 and has taught at colleges and universities across the United States since 1981. His focus areas are project management, purchasing, continuous process improvement (CPI)/Six Sigma, and supply chain management. Tony manages a successful consulting firm, and his industry experience includes 20 years of supply chain management. He earned an MBA from California State University, Long Beach, and holds professional certifications in six disciplines, including the Project Management Professional (PMP) certification from the Project Management Institute (PMI). Online Business Management Course requirements: For taking this instructor led Online Business Management Course you need Proficiency with basic algebra, Internet access, e-mail, and the Microsoft Internet Explorer or Mozilla Firefox Web browser. "Thank you. Great course, very helpful to a small business owner." "Thank you for this course. At one point in time I thought that I was in over my head due to the fact that I came into this course as a novice office manager. I learned a lot and hope to one day further my education." "Tony Swaim has provided me with an excellent and practical concept of business fundamentals. I would like to commend him for a job well done." "Mr. Swaim had terrific link sites for continued reading, I really liked the course and will be taking Mastery of Business Applications. The course was perfect for the Business Beginner, I felt challenged, but not overwhelmed." "I use the material in this course on a daily basis and was able to obtain even more valuable information." "I enjoyed the course material very much. I found the instructor very knowledgeable and competent, presenting concise fashion a broad range of information. I like very much his style of writing - it is fluent, easy to read. Thank you." "I learned a ton, very good course!" "This is a great course for getting a broad overview of several areas of business fundamentals. I found all of the content to be useful, without bogging into too many specifics. Thank you!" "This course was great for a member of the business world who wanted to learn the fundamentals of how a business works. I learned a great deal, and I hope to learn much more in the second class (Mastery of Business Applications). I have taken several classes instructed by Tony, and I have learned much in all of them. I have found Tony to be very approachable and easy to question. He provides timely, appropriate, and thoughtful answers to the student's questions. Additionally, he offers encouragement." "I want to thank Mr. Swaim for the course. It has been a great experience for me having been out of school for a long time. This was an eye opener for me if I would pursue my masters. Thank you very much." "This class was the perfect avenue for learning business basics on my time. I was challenged at times, entertained other times, but always took away useful information from every lesson." "A well-rounded course. Touched on many of the essential aspects of business. Even though I have been in business for over 20 years, I found myself learning something new with each lesson. Thank you, Tony." ExpertRating is one of the world's only ISO 9001:2015 Certified companies (from TUV America) offering an Online Business Management Course (leading to ExpertRating Business Management Skills Certification). When you choose the ExpertRating Online Business Management Course you can be sure that you are buying a premium International certification that is recognized by hundreds of employers and Government bodies in the US and other countries. With ExpertRating you get certified quickly online and you are equipped with a store house of information through the in-depth Online Business Management Courseware which has been developed by experienced Business Managers. The ExpertRating Business Management Skills Certification is by far the best value for money instructor led Business Management Program at $129.99. How much does the Business Management Certification cost and what does it include? You can buy this Online Business Management Course leading to Business Management Skills certification at a special offer price of only $129.99 which includes the in-depth Online Business Management Courseware and exam fee. This is the best value for money Business Management Program available till date. You get the following services within the USD $129.99 fee. In-depth Online Business Management Courseware including scenarios and case studies. World wide airmail delivery of the hard copy Business Management Certificate. 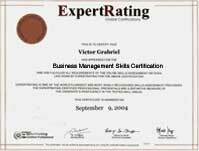 The Business Management certificate can be used to prove your certified status and does not mention the words "online". The process of getting yourself certified is very simple. All you have to do is buy the ExpertRating Online Business Management Course for $129.99. Log in to the instructor led course using your password. Go through the Online Business Management Courseware (which would take you 6 weeks) and complete the final Business Management certification exam at your convenience. You can complete the exam within 2 months of buying the Business Management certification. The result of the exam appears as soon as it is completed, and your Business Management certificate is mailed immediately. Chapter assignments to help you practically use the Business Management skills that you will learn during the Business Management Course. The final exam is fully based upon the Online Business Management Courseware that is provided along with the Business Management certification. If you have gone through the courseware properly you should not have a problem clearing the exam. The exam consists of multiple choice questions from all chapters of the Online Business Management Courseware. Certified Business Managers can earn up to $80,000 yearly! According to the Bureau of Labor Statistics, U.S. Department of Labor, Occupational Outlook Handbook, Business Management is a field that's growing at a faster than average rate with an estimated 276,000 Business Managers required by the year 2016 in various industries including public agencies, corporations, educational institutions and charitable organizations. If you're interested in a career in Business Management, now is an excellent time to jump in. Attainment of the Business Manager Certification offered by the ExpertRating, through education, work experience, and successful completion of examinations, can help to enhance a manager’s advancement potential in the same or a different organization. This management course is also an excellent aid to those looking forward to a small online business management course . In the first lesson, you'll learn the ins and outs of strategic planning. You'll find out why you need to define your business in terms of the customer and why you must have the right ingredients in place to meet customer demands. This lesson will discuss how environmental factors, such as technology and economics, shape your company. You'll also see how the internal environment determines how well your organization responds to opportunities and threats. One must believe in the phrase, "Plan your work and work your plan" because it has great applicability to strategic planning. Lesson 1 will begin by discussing the elements you must use to effectively implement your strategic plan. In this lesson students will study vision statements, move on to purpose and mission statements, and discuss goals, objectives, strategies, policies, and procedures. Next, this lesson will focus on company culture and you'll find out why planning is beneficial. Finally, this lesson will look at the major strategic choices that you can choose from, ranging from core business focus to insolvency. Organizing is a critical topic that many companies struggle with. Once you have a good idea of how to develop and implement a strategic plan, you need to take the next step. This lesson will discuss how to organize resources so employees can perform job duties and relate to one another in the most effective way possible. It will share the purpose of organization and present several coordinating principles, including authority, power, and span of control. It will also spend time exploring the staffing function and evaluate the elements—recruitment, selection, appraisal, and development—and study six different forms of organizational charts. Today’s lesson will discuss three key management principles: motivation, leadership, and control. Motivation and leadership, as compared to control, represent a more subtle side of business. While control focuses on concrete things such as analysis and procedures, motivation and leadership rely on less tangible factors. The lesson will begin by defining motivation, exploring four theories of motivation, and then moving into leadership. You'll learn about the types of leadership and see how delegation and empowerment differs. The lesson will finish up by investigating control and learning how to effectively use three different control processes. This lesson and the subsequent four to follow will help you increase your mastery of financial fundamentals. It's important that you increase your readiness to use financial information to identify and understand problems and opportunities, and also make decisions. This lesson will discuss the elements of the general ledger, explore a few key accounting terms, contrast accounting and bookkeeping, and investigate the different types of accounting. You'll learn about vital accounting concepts, such as the accounting equation, debits and credits, and the cost principle. Now that you have the basics of accounting safely under your belt, it's time to start looking at how to apply financial information. Lesson 6 will start off by reviewing two financial statements that you find at nearly every organization—the balance sheet and the income statement. Without these two documents, it's impossible to determine how a firm is performing. After covering the balance sheet and the income statement, you'll learn how to account for inventories and understand about the significance of cash flow. This lesson will also explain why sound cash management helps any company stay on the right path. Cost is the price you pay to acquire, maintain, produce, or use materials or services. Since most firms account for their operations at cost, it's essential that you understand how costs are determined and used. Today's lesson will discuss the nature of discretionary, relevant, sunk, and variable costs, and many more. You'll also discover how managerial accounting differs from financial accounting. The largest investment that many businesses make is in their land and buildings. Firms also make smaller, more frequent investment decisions for items such as equipment and fixture purchase and replacement. Today you'll learn about the different types of investment decision-making models, including average rate of return (ARR), payback period, discounted cash flow (DCF), net present value (NPV), and internal rate of return (IRR). This lesson will also examine the nuts and bolts of financial planning. The last lesson about financial matters will wrap things up by examining budgeting. In order to be successful and make meaningful decisions about the future, you must look ahead. One way to do this is by preparing budgets. Accounting, as a major organizational function, supports a number of different types of budgets. This lesson will show you how to use the major budgets, including the department administration budget (also known as an expense budget), the production materials budget, the maintenance, repair and operating (MRO) budget, the capital budget, and zero-based budgeting. Today’s lesson will examine performance measurements as a way to keep track of progress. Studies reveal that if you don't measure a process, you can’t properly manage it. The lesson will begin with a discussion on how human nature affects performance measurements. You'll learn about the attributes of effective performance measurements and see how traditional and progressive performance measurements differ. The topic for this lesson is business law. The objective is to help you develop a good overview of business law and also learn about some important concepts, such as the principal-agency relationship and the basics of contracts. This lesson will begin by talking about the nature of laws, move on to explore the basics of a legal system, and then discuss the essence of commercial law. Now that you have a basic understanding of business law, the last lesson will take a look at the four most popular organizational forms: sole proprietorship, general partnership, limited partnership, and corporation. In this lesson some time will be spent on talking about organization politics. Wherever people work together, you'll find politics. This lesson will go over "good" and "bad" politics and discuss how ethics relates to politics.